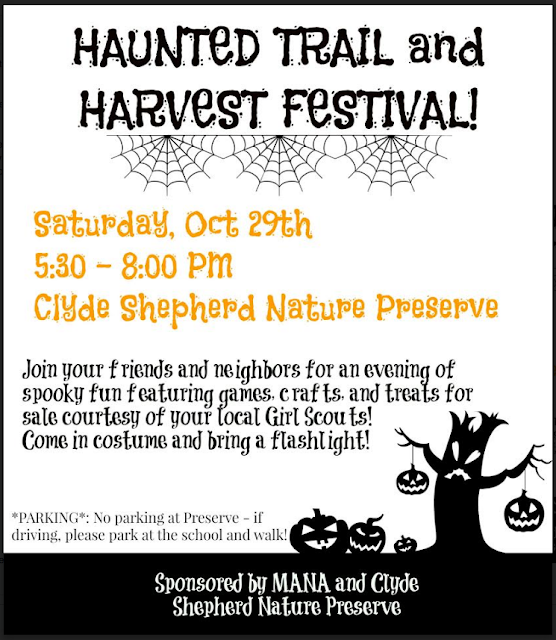 Haunted Trail and Harvest Festival at the Clyde Shepherd Nature Preserve! The haunted trail will feature spooks for all ages - the further you go, the spookier it gets! Food will be available for sale from our local Girl Scouts, and there will be games and crafts as well. We encourage you to come out and celebrate Halloween with your neighbors. Come in costume if you like, and bring a flashlight! We are looking for additional volunteers to help with the event. If interested, please email Adrianne Leonard at ackerns@gmail.com Thanks! NOTE: Parking is available at the school - please take advantage of that rather than parking on Pine Bluff or Harrington. It is about a half mile from the trail.